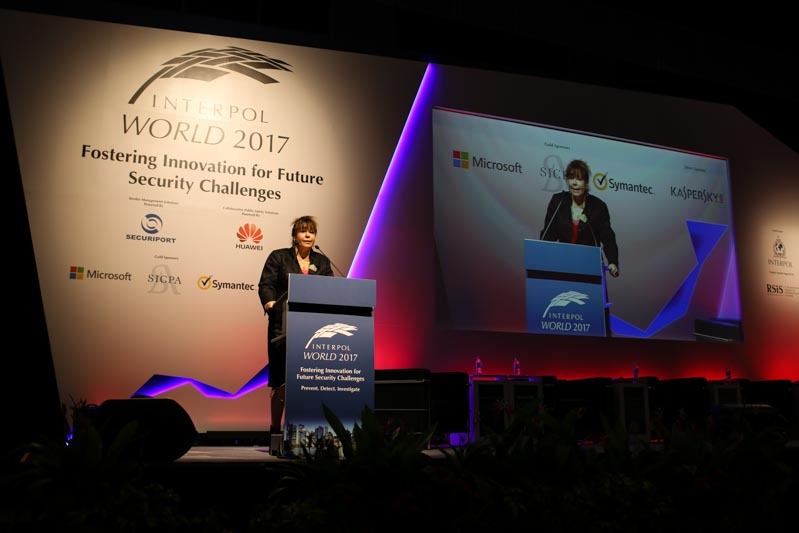 Above photo: Dr. Narjess Abdennebi gives her keynote address at the INTERPOL World Congress 2017 held in Singapore. Photo by Dean Koh/OpenGov Asia. Many of us travel by air for both work and leisure, usually going through customs and immigration at different countries with minimal hassle. However, there are processes and standards in place which help the clearance process of both people and goods, not just at the country or state level but also at the global and international level. One of these standards is the issuance of machine-readable passports by states so that information about the traveler can be verified across different countries. OpenGov had the privilege to speak to Dr. Narjess Abdennebi, Chief Faciliation Section at ICAO at the INTERPOL World Congress 2017. Dr. Abdennebi has a wealth of experience in the air transport industry across a variety of marketing, sales and research positions prior to joining ICAO in 2008. In this interview, Dr. Abdennebi shares about her work as Chief Facilitation Section, recent developments in Machine Readable Travel Documents (MRTDs) and ICAO’s role in working with different states to ensure compliance with ICAO standards. Could you tell us more about your role as Chief Facilitation Section at ICAO? Let me start by giving you more information about ICAO. ICAO is a specialised UN Agency, we have 191 members and we are in charge of developing standards, recommended practices and policies for safe, secure and efficient development of international civil aviation. We have 5 strategic objectives and among these objectives we have aviation security and travel facilitation. Facilitation is really to enable and facilitate the clearance process of travellers at the borders – this will be done through the customs, health quarantines, etc. The role of facilitation is really to accelerate the clearance process of both passengers and cargo while ensuring security.In my role as Chief Facilitation, I am managing all the standards and recommended practices of Annex 9, which is related to facilitation Annex 9 of ICAO – there are 19 Annexes in ICAO. What are some of the recent developments/trends that you observe in the area of Machine Readable Travel Documents (MRTDs)? In fact, ICAO has been the leader in MRTD technologies for more than 30 years and it have been recognised by the international community that ICAO should have the leadership. This is because more than 50% of international travellers are travelling by air which is why ICAO had been recognised as having the leadership in developing secure, machine-readable travel documents. However, in the last decade, what we have seen in terms of fraudulent methods is that it is becoming more and more difficult to counterfeit secure travel documents because we have been adding security features to MRTDs. That is why someone who is willing to counterfeit travel documents – it is easier for this person to fake the birth certificate because it does not have a lot of security features on it. That’s why since 2013, we have implemented a new strategy, we have called it Traveller Identification Programme (TRIP) Strategy and it is based on 5 elements. The first pillar is as I said, we need to ensure that Evidence of Identity of the person is confirmed. Then of course we have the MRTD and we are still developing the technical specifications for issuing the MRTDs. Next we have document issuance and control. For instance, the states have to ensure that their blank documents are stored in secure location. The fourth element is inspection systems and tools, that also we have developed an inspection system, which is called ICAO Public Key Directory (PKD). These inspection systems allow, when you are at the border, to confirm that the passport that you are checking in with has been really issued by the state indicated on the passport. Finally, the interoperability applications – when you are travelling at the borders, you have to check if the passenger, for instance, is not on the INTERPOL Stolen and Lost Travel Document (SLTD) Database and also to check if the name of the passenger is not on terrorist watchlists. In the interoperability applications, you also have to implement an Advanced Passenger Information (API) system. What steps is the ICAO taking to ensure timely integration of data from multiple sources, such as INTERPOL Stolen and Lost Travel Document (SLTD) Database, Advanced Passenger Information (API), Passenger Name Record (PNR), “Watch lists” Bilateral and multilateral exchanges etc.? Well, actually it is for the states to implement and what ICAO is doing that we’re issuing standards, which states have to report for instance to the SLTD if there are any stolen or lost travel documents. This is one standard that ICAO is doing. When you have a standard, it is mandatory for the states to implement it or to mention to ICAO that they cannot implement it for whatever reasons. ICAO is really developing the regulatory frameworks and it is up to the states to implement it in their structure. And then of course, every state has perhaps a different environment and they will implement it according to their own standards. What are the current challenges in Evidence of Identity (EOI) authentication? Can you tell us about ICAO’s approach to it? It is basically because we have discovered that you can have very secure, machine-readable document but it has not been given to the right person and this is of very high concern because you may have someone who has bad intent travelling and he has the right travel documents, we’re not sure who is this person. In EOI, we understand it is complicated for states to implement reliable EOI processes but what we are saying to each state is that you have principles that you have to follow and these principles are notably, as I mentioned, you have to check whether the person is alive or not. Because in most of the cases, when someone has stolen the identity of someone else, this person is likely to be dead – you have to cross check birth and death registers. You have to ensure, for instance, if it is really the right person in front of you by asking perhaps for 2 other identity documents. In terms of ePassports, how does ICAO work with different member states to ensure compliance with ICAO standards? What are some of the associated challenges in working with governments across the world? For compliance, there are certain standards related to security, certain standards of Annex 9 which are audited, so we’re auditing some of them in each state and we’re trying to audit as many states as we can per year, of course. Through that, we’re making recommendations to the states in order for them to implement the standards because in fact, all of that is behind the TRIP Strategy, it is really standards and recommended practices from the Chapter 3 of Annex 9, mainly. In the meantime, as it has been recently implemented, the ICAO TRIP Strategy since 2013, we’re still assessing what are the needs of the states in terms of assistance in the capacity building. We’re in the process of analysing the data that is reported to us by the states, in order to provide them with the right assistance in helping them. Meanwhile, we have developed for them the TRIP Road Map, explaining to them how they can implement the TRIP Strategy in an effective manner. How does ICAO render assistance to smaller member countries/states which may not have the technological knowledge or resources in implementing for example, biometric passports which may be very costly? First, I would like to mention that biometric passports are not mandatory for states to implement, that is not a standard. We’re not in the process of setting any standards for that but the standard is that every state should issue machine readable passports, that’s very important. As I mentioned, we have already 143 states complying with the November 24 2015 deadline to issue only machine-readable passports. The rest of the states (remaining 48 out of a total of 191), we are asking them on a one-to-one basis, what their needs are in terms of assistance and how we can help them in implementing these standards, this is the way we’re working. We have in ICAO a technical cooperation bureau, which is in-charge of finding ways to assist and implement ICAO standards.